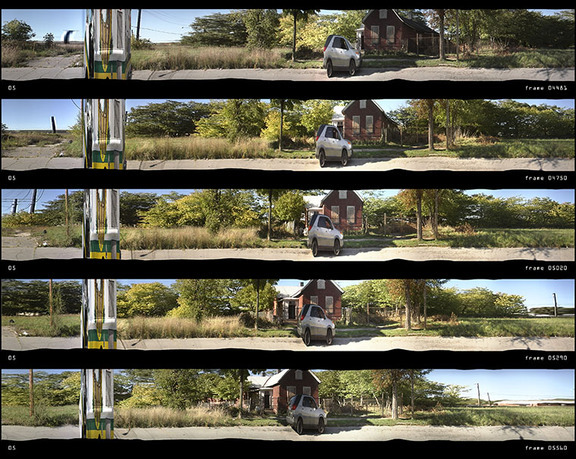 Andrew Zago and Laura Bouwman, XYT: Detroit Streets, digital video, 6 min. 05 sec. 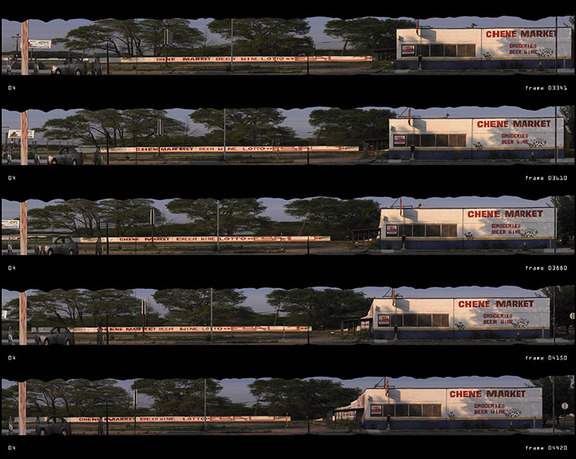 (looped), film still, 2008, Detroit, MI. Courtesy of Zago Architecture. 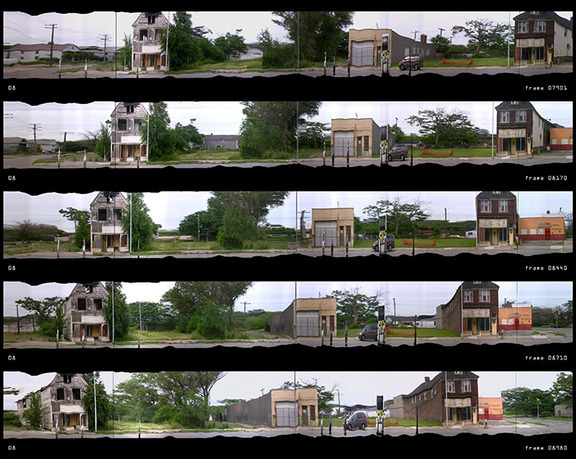 XYT: Detroit Streets is a suite of nine short films documenting streets of Detroit through a novel process of Zago Architecture’s invention. 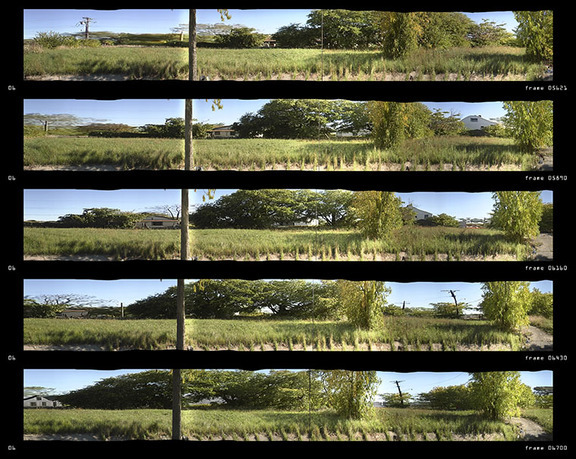 This process entails both structured camera movements and post-production digital techniques. 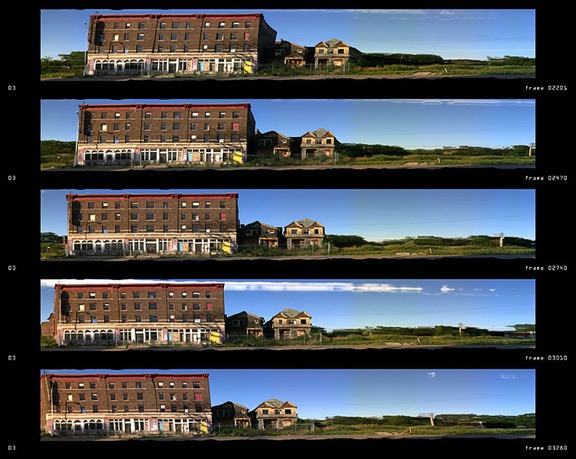 The suite is presented as a large-format, looped, multi-projector installation. 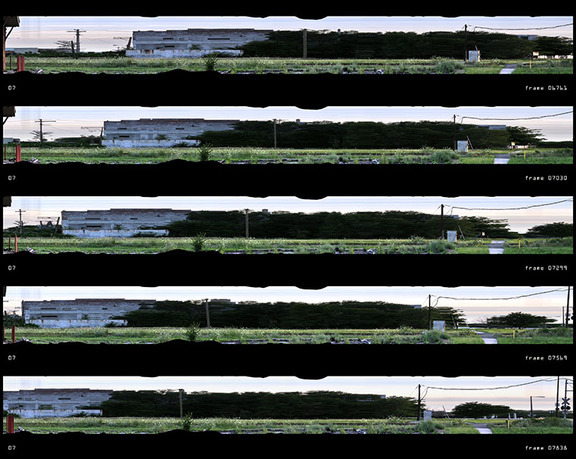 XYT refers to a representation technique that inverts the terms of conventional photography and film in that it swaps time and motion for depth. 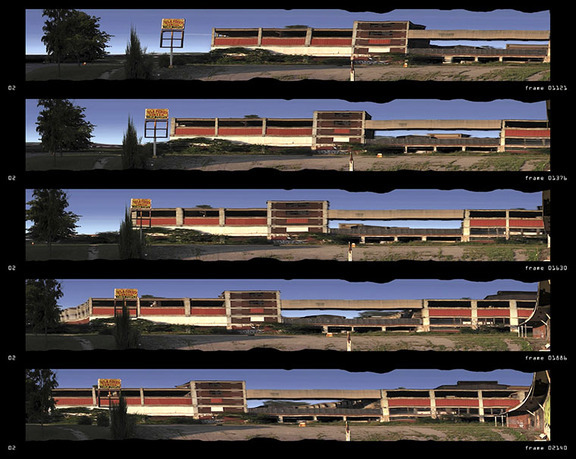 The films reorder the mechanics of depth and movement in order to draw out a pervasive, but ephemeral, atmosphere produced by Detroit's extraordinary urban condition. As an urban documentation it is linked, historically, to such works as the eighteenth-century panorama and Eugene Atget's views of Paris. As an experimental film technique, it is tied to the works of Jacques-Henri Lartigue, Étienne-Jules Marey, and Eadweard Muybridge. Unlike these works, which laid the groundwork for early-modernist spatial sensibilities, XYT: Detroit Streets captures a contemporary sensibility of unsettling distortion and movement and applies it to a post-industrial urban landscape. Andrew Zago, principal and owner of Zago Architecture, has over twenty five years of professional experience in architecture, urbanism, and education. He is a licensed architect in California and Michigan. He received a Bachelor of Fine Arts from the University of Michigan and a Master of Architecture from Harvard University. In 1987 he founded AKS RUNO in Los Angeles with Bahram Shirdel and later, Shirdel Zago Kipnis with Bahram Shirdel and Jeffrey Kipnis. 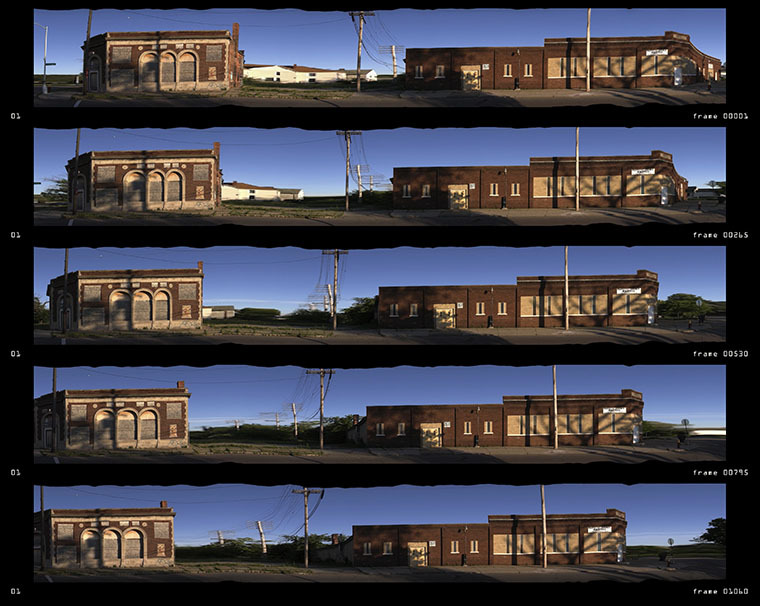 In 1991 he established Zago Architecture in Detroit. Zago currently teaches at the Southern California Institute of Architecture (SCI-Arc) and is the coordinator of their visual studies program. He is also currently a clinical professor at the School of Architecture, University of Illinois at Chicago (UIC). From 2003 to 2007 he was the founding director of the Master of Architecture program at the City College of New York, and he has also taught at Cornell University, the University of Michigan, the Ohio State University, and the University of California, Los Angeles. He frequently lectures, and his work has been exhibited in Los Angeles, New York, Detroit, Princeton, and Berlin. Zago is a fellow of the American Academy in Rome and a member of the National Register of Peer Professionals of the General Services Administration in Washington. He is a recipient of both an Academy Award in Architecture from the American Academy of Arts and Letters and a fellowship grant from United States Artists. Laura Bouwman is a senior associate at Zago Architecture. She studied architecture at MIT where she received both her Bachelor of Science and her Master of Architecture degrees, graduating Phi Beta Kappa, and with the Imre Halasz Thesis Prize for her work. She has been with Zago Architecture since 2003 and is a licensed architect in California and Michigan. Prior to Zago Architecture, she worked in the Paris office of the Renzo Piano Building Workshop, and has taught at the University of Michigan. 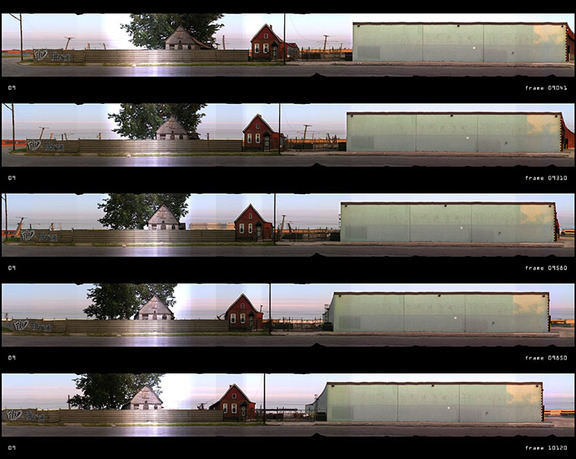 Bouwman was project architect for the Museum of Contemporary Art Detroit, and has held leadership roles in other projects, publications, and design competitions.